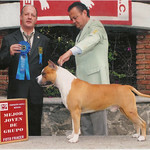 DAM: UKC GR.CH.PR' BIMBIS BUENOS AIRES DORA DA XPLORA "DORA"
Dam: Our Bred By AKC CH. UKC Buenos Aires Abbie Baby "Abbie"
Sire: AKC GR.CH.UKC Bacardi Boy of Daft Raptors "Bacardi"
Sire: AKC.CH/UKC CH Cadburry Tipit z Hanky "Armani" CGC. Dam: AKC Pt' d /UKC CH Buenos Aires Legcy 1 The Best for last "Faith"
Sire: AKC/UKC Tmbrld's Five OH of Mustang "Boss"
Dam: UKC CH Marin's Buenos Aires Ms. Tequilla Sunrise "Tequi"
The Current Top Producers listwas compiled by the United Kennel Club using all data for progeny of these females whelped on or after January 1, 2001, and for that progeny’s UKC titles earned and processed from January 1, 2001 through December 1, 2009.